Brown trout, large fishing picture below, is of European origin and was introduced into the Patagonia region of Argentina/Chile during the early 19th century. The fish easily adapted to the cold lakes and rivers that were filled by the glaciers and snow filled Andes Mountains. The large availability of insects in and out of the water and as well as small native fish contributed to the successful adaptation into the lakes and rivers. This colorful and feisty trout can provide exciting fishing. It can be a strong, ferocious fighter and a challenge to any experienced fly fishing enthusiasts. 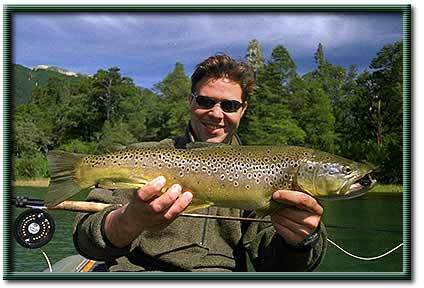 The picture below is one of such brown trout and fly fishing enthusiast. My son Justin Schoenauer, started out guiding when he was fourteen. His first guiding experience was with an elderly lady of 74 who suffered with arthritis and need help getting around. Justin showed at an early age the qualities needed to be a good guide. His patience and kindness emerged as he worked with his first client. Fly fishing the different variety of trout and salmon can be learned and enjoyed at almost any age, so the range of angling skills and age can combine to make the task of guiding a real challenge. The best guides do not fish when guiding their clients, as they get their pleasure from helping and watching people catch fish. Observing and learning, then putting to practice those things you have learned, whether it be from the persons you guide or from the constant changes taking place above and below the water, is a must in becoming a good fishing guide. Patagonia Adventures takes great pleasure in training and using guides that display these kinds of qualities. Justin in this picture is holding one of the many browns he caught this fine day at Alerces Park, Chile, his favorite place. He had never fished having someone guiding him. That day gave me great pleasure to be a fishing guide and a father to a kind and patient man. He showed his kindness again and released the fish. If you are coming to Argentina or Chile and looking for a good fishing guide and some great lodging, contact us today and experience a great fishing adventure. We not only do we have the lodges (Alerces Park Lodge, Argentina, Rio Yelcho Lodge, Chile and Alto Puelo Lodge on the Chile and Argentina border) we also have an experienced and knowledgeable fishing guide for you!